The bentgrass fairways and greens – first to turn emerald in the spring, last to lose their lush beauty in the fall – are just the beginning. Sycamore Ridge is like two superb golf courses in one. The steep, wooded hillsides, valleys and streams of the front nine lead you to the gently rolling, links-style back nine. Sycamore Ridge has earned its reputation as one of Kansas City’s premier public golf courses with its stunning combination of bent grass, white sand bunkers and 18 holes of exciting and challenging play. From the elevated, wooded hills of its front nine to the gently rolling back nine, Sycamore Ridge has golfers coming back again and again. Destined to become the tourism destination for golfers throughout the region, Sycamore Ridge Golf Club never fails to please. The full experience challenges your skills even as it calms your spirit. It’s no wonder Golf Digest names Sycamore Ridge the number-one course in Kansas City year after year and Zagat has added the course to its list of the finest in the United States. Sycamore Ridge is golf at its very best. 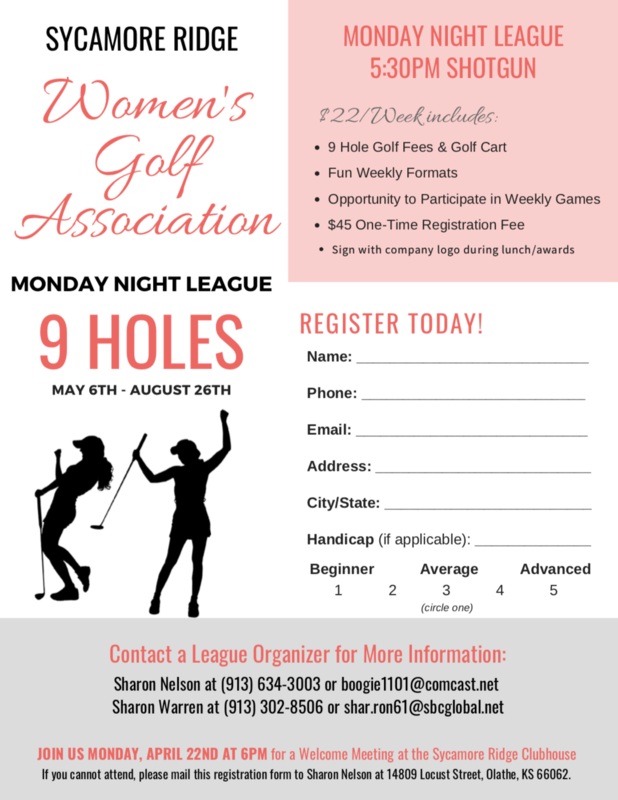 Find out why so many golfers from throughout the Midwest play for the pleasure and come back for the challenge at Sycamore Ridge. Book Online to save money on your next round! 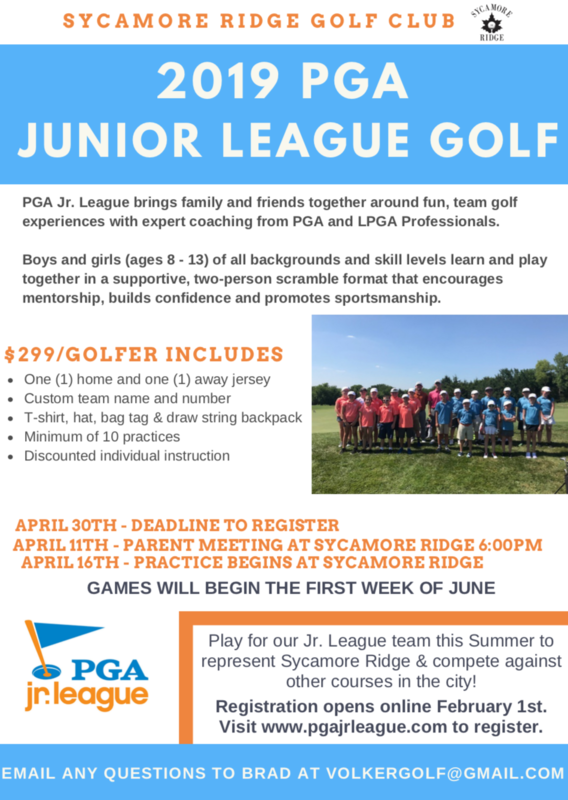 Boys & girls (ages 8-13) of all backgrounds and skill levels learn and play together in a supportive, two-person scramble format that encourages mentorship, build confidence & promotes sportsmanship. Time to fiesta! 9AM Shotgun. 3 Person Scramble. 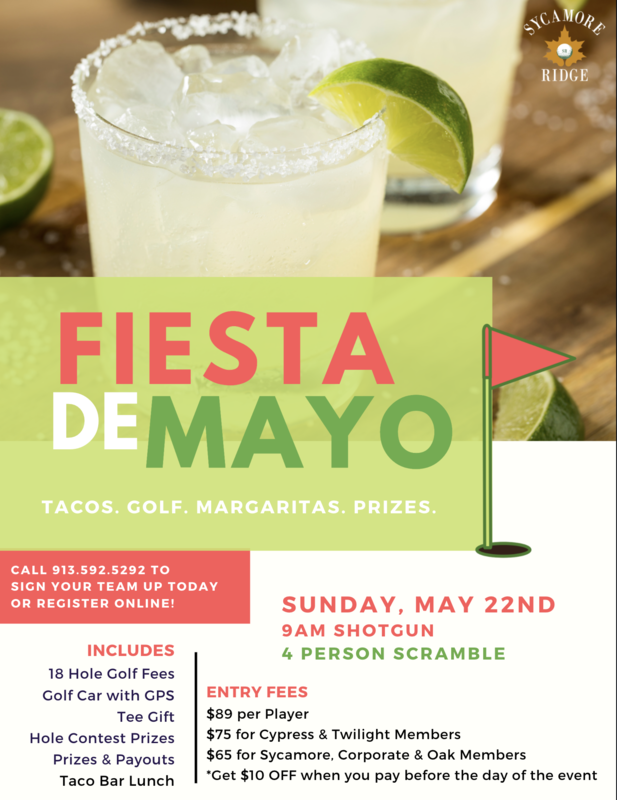 Includes 18 holes with a Golf Car with GPS, Tee Gift, Hole Contests, Prizes, & Payouts, Taco Bar Lunch, Margarita & Corona Specials.